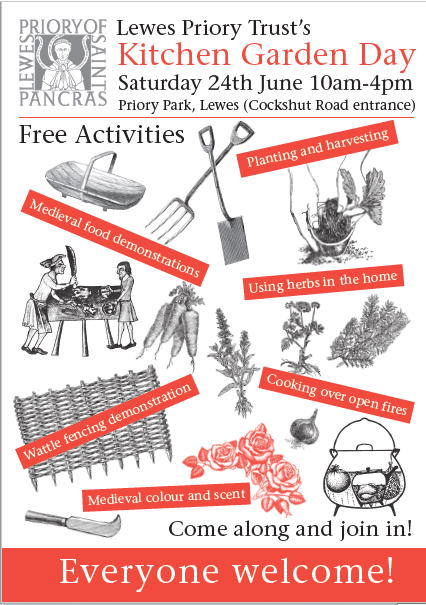 Saturday 24th July 2017 will be the official launch of the new community medieval kitchen garden at Lewes Priory Park. The day runs from 10am until 4pm and everyone is welcome. 10-12.30am. ‘Woven Willow cloche plant support. Students will learn how to make a strong but beautiful woven support that can support peonies or provide a frame for climbers such as clematis. 1.30-4pm. Woven Border Hurdles’. Students will learn the techniques and take home a finished woven willow border hurdle that can be used as path edging or decorative finish to a raised bed. Please email tracyjaneanderson@me.com if you are interested in booking on one of these two wattle making sessions.